While we're waiting for Spring Training to get into full swing, we can always reflect on the good old days. Years ago, when the ground was covered with a white blanket of snow, and icicles hung from the roof, it was time for "hot stove talk." Oh wait! We do have snow on the ground, up to our waist, and there are three-foot icicles hanging from the roof! The term "hot stove," however, came from the days when men gathered around the pot belly stove, at the general store or the barber shop, and swapped stories about baseball. Stories about days gone by, and the play of Grover Alexander, Chuck Klein and Lefty O'Doul, or the promise of another Spring with the likes of Andy Seminick, Richie Ashburn or Robin Roberts. Speaking of the good old days, getting an autograph, years ago, was a lot easier than it is today. 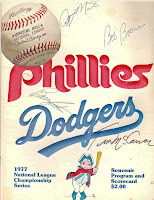 There were no autograph sessions where you paid $10 to 20 for a ballplayer's signature. At Connie Mack Stadium, for instance, we would hang out on the street, and just wait for players to come out the door onto the sidewalk. One night, when my sister, Marianne, was about seven years old, she approached a towering player who just entered the crowd on the street. She piped up, "Hey, mister, are you anybody important?" "Oh, I don't know," came the reply. She quickly shoved a baseball in his face and said, "Well, give me your autograph anyway!" He graciously complied, and when she returned, I asked her, "who was it?" "I don't know, some big guy," she quipped as she handed me the ball, and I read the signature Hank Aaron! On another occasion, my father caught a foul ball that was hit by a player on the Milwaukee Braves club. After the game, he asked one of the players hanging out of the window on the team bus to pass the ball back to player who hit it, and have him sign it. He gladly obliged. Problem was, three weeks later, we needed a baseball for a pick-up game and guess which one we used? Yes, those were the days, and Veterans Stadium was quite the same. A kid could wait after a game and get dozens of autographs outside the stadium. Some of the autograph's that I managed to collect over the years include: Tony Perez, Richie Ashburn, Tim McCarver, Bob Boone, Jerry Martin, Denny Doyle, Frank Luchese, Deron Johnson, Jim Bunning, and Pete Rose. Heck, when my father was a kid, living in Mayfair back in the 1930's and 40's, he used to play catch in the evenings with some of the A's players, who lived in the neighborhood. That was also the era of strictly day games. Yes. Players were accessible in those days, and perhaps, that is why a trip to Spring Training is so popular. It is an opportunity to get a little closer to the players. Fantasy Camp is another popular way for baseball fans to rub elbows with the players. For a week, or so, an ordinary Joe, can put on the Phillies' pinstripes, and make like a big-leaguer! Well, I guess that's enough reminiscing for now. I'll close with a poem written by James Michener in 1980 when he heard the Phillies beat Kansas City in the World Series. Michener penned the poem while flying on a plane bound for Bangkok. Wreathe their noble brows with laurel. And we kept our expectations. Strikeouts with the bases loaded. All our hopes again exploded. Are they not a bunch of dillies? Through some holy fire internal. Dance until the earth has shaken. Have at last brought home the bacon. Garland them with timeless lilies!